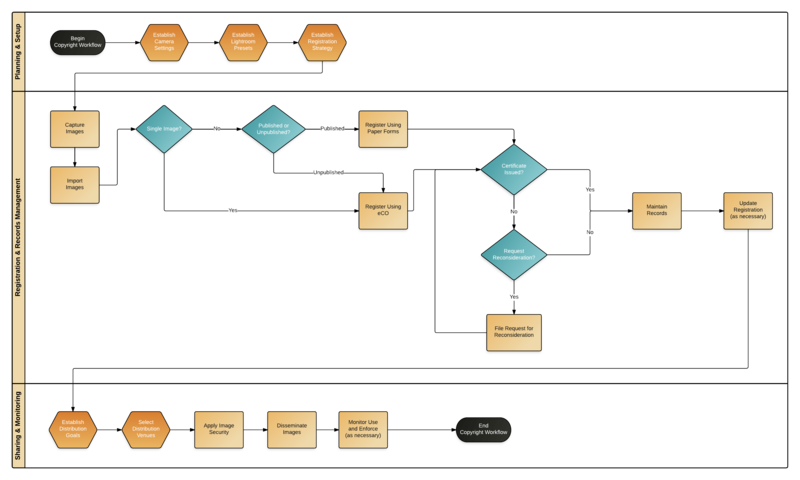 Copyright Workflow is a system aimed at helping visual artists incorporate sound copyright management practices into their existing routine workflows. Through a suite of educational tools, artists will gain a better understanding of copyright law and the copyright registration process, digital asset management techniques, and best practices for distributing and sharing images in ways that are best suited to their business models and artistic objectives. Managing your copyrights doesn’t have to be complicated. Just a few simple steps that are organized into three phases. 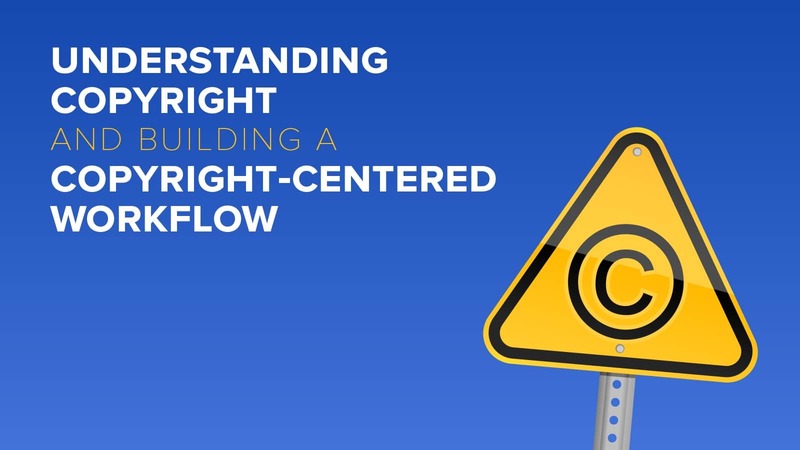 Here is where you lay the copyright foundation for your entire workflow. It begins before you even start shooting. The second phase starts when you have an image, or a batch of images, that you need to process. This phase is about registering your work with the Copyright Office, maintaining your own copyright records, and updating the public record, as necessary. Once your registrations completed (or in the works) and your records in order, you can turn your attention to sharing your work and monitoring for unauthorized use, which is the third and final phase of the workflow. 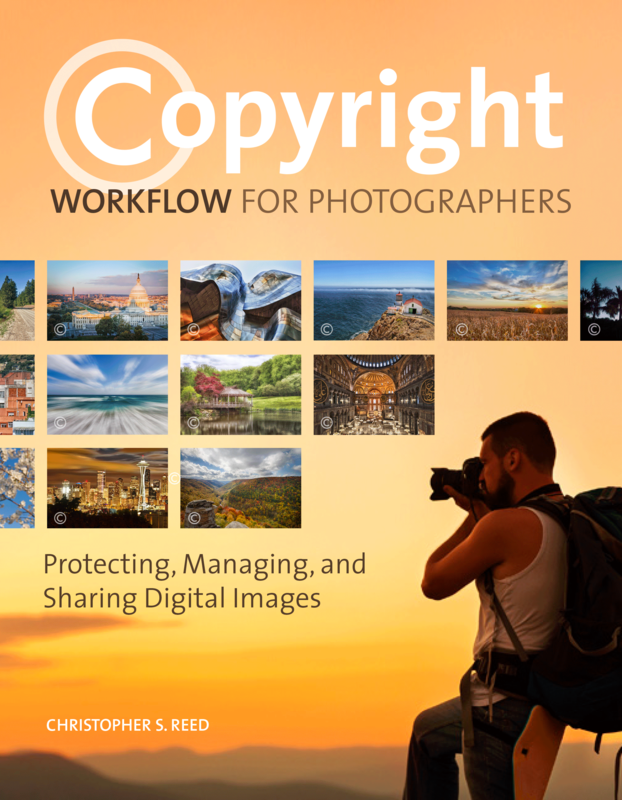 Click below to download your free copy of the complete workflow, and when you’re ready to learn more, check out the book or our seminars for detailed step-by-step guidance on managing your copyrights, from the camera to your website. Written by Chris Reed, a photographer who also previously served a senior policy advisor at the U.S. Copyright Office, there is no other resource better equipped to help photographers through this essential, yet hard-to-tackle, topic! Live training on law generally, copyright basics and building sound copyright policies and practices into existing workflows. Presentations are dynamic and flexible, and can be structured to accommodate your group’s unique needs. This information-packed seminar answers these questions and more, helping you build best practices for copyright registration and management into your existing image processing workflows. 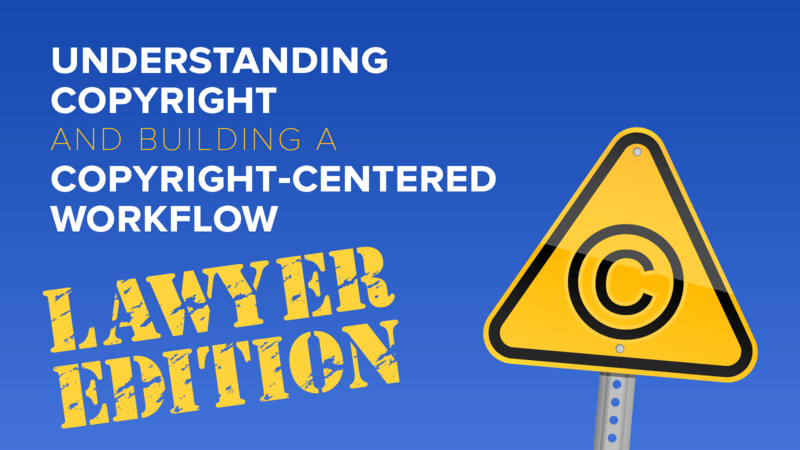 Part legal tutorial, part software tutorial, this seminar will help you understand essential copyright concepts that apply to you and your business, and teach you how to maximize your rights without sacrificing exposure. Substantively similar to Understanding Copyright and Building a Copyright-Centered Workflow this presentation considers copyright law and sound copyright registration and management practices through the lens of the statutes, regulations, administrative practices, and recent cases that form the foundation of those practices. Designed specifically for lawyers and paralegals who represent visual artists, attendees will come away with practical tips and techniques for advising their clients along with the relevant legal and policy background. Note: Although this presentation is designed to serve continuing legal education requirements, it has not been approved for CLE credit by any jurisdiction. Certification and approval of the presentation’s content for CLE purposes is the responsibility of the sponsoring organization. The past several years have brought the most robust policy debates about copyright policy that we have witnessed in nearly four decades. Congress recently concluded a two-year review of the existing copyright law (most of which is, itself, more than three decades old) comprising more than 20 hearings and 100 witnesses from every corner of the copyright community. In this information-packed session, participants will learn about the ongoing review process, the major issues facing the copyright community, and some of the various proposals for addressing them. Note that while this presentation discusses several issues of specific interest to visual artists, its coverage is much broader, discussing issues relating to copyright law generally. The presentation focuses primarily on U.S. law and policy developments. Copyright Workflow is the brainchild of Chris Reed, a lawyer and photographer based in Los Angeles. 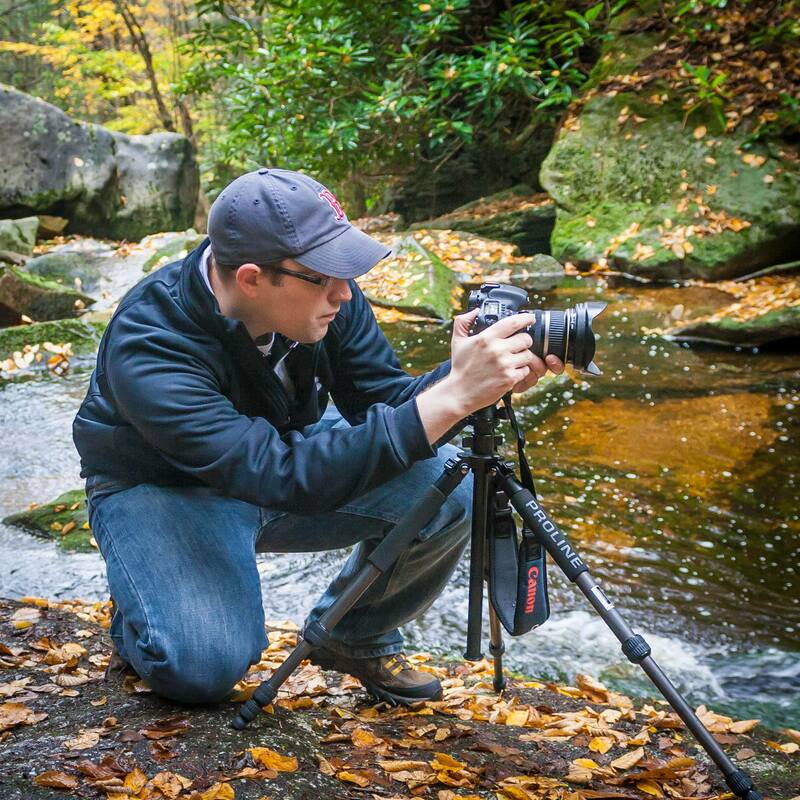 On the legal front, Chris specializes in copyright and entertainment law; photographically, he focuses largely on landscape and travel photography. Chris served as senior advisor for policy and special projects at the U.S. Copyright Office. 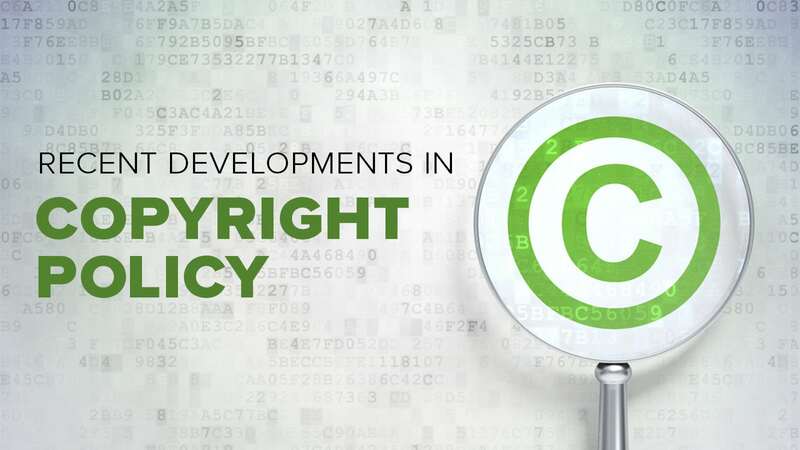 In that capacity he advised the Register of Copyrights on a variety of issues relating to copyright law and policy, technology, and the Office’s registration and recordation systems. He was involved in several of the Register’s major speeches and publications, including The Next Great Copyright Act, and The Next Generation Copyright Office: What it Means and Why it Matters, as well as Congressional testimony on a variety of topics including copyright law revision, online piracy, and routine agency oversight. Prior to joining the Copyright Office, Chris served as an attorney in the Antitrust Division of the U.S. Department of Justice, where he worked principally on matters relating to the entertainment and media industries. Chris participated in the United States’ investigation of the proposed Google Book Search Settlement Agreement and helped prepare the government’s two court filings in the case. Chris also served in a leadership role on the Justice Department’s investigation of the joint venture between Comcast Corporation and NBC-Universal, Inc. In addition, he was the primary attorney responsible for monitoring compliance with the ASCAP and BMI consent decrees. Chris received his B.S. (economics) from Lehigh University and he holds a J.D. and LL.M. (intellectual property) from the University of New Hampshire School of Law where he served as editor-in-chief of IDEA®: The Intellectual Property Law Review, and where he currently serves as an adjunct professor teaching an advanced copyright course as part of the school’s intellectual property master class curriculum. After graduation, Chris served as a law clerk to the Honorable Steven J. McAuliffe, Chief Judge of the U.S. District Court for the District of New Hampshire. Questions? Comments? Want to schedule a presentation for your group? We’d love to hear from you. © Copyright 2018 CSR IP Holdings, LLC. All Rights Reserved. Copyright Workflow and the Copyright Workflow logo are registered and unregistered trademarks, respectively, of CSR Media, LLC.